One of the funnest things about gardening is that you often find things that surprise you. Sometimes they are bad (like pests) and sometimes they are simply pleasant. 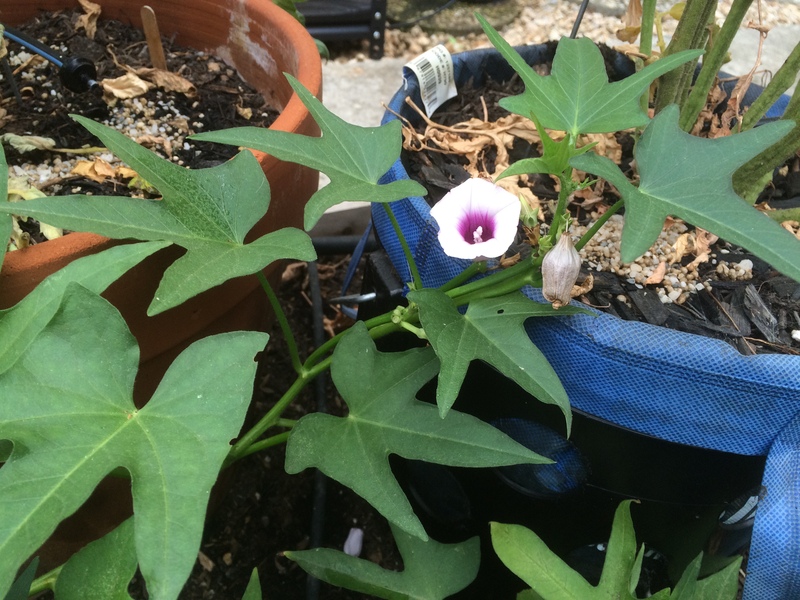 Two weeks ago, I discovered that there is a sweet potato growing in my raised garden – a volunteer. Its vines are growing all over the raised bed. It must have stayed behind from last year’s harvest – a pleasant surprise. For a tuber plant like the sweet potato, flowers are almost redundant because most people grow them out of “slips” or slices from the “eyes” of the potato. But I like the way it adds the white and purple color to my raised bed. There are just a couple of months left before the weather gets too cold and the day gets too short to grow something like a sweet potato. But I probably keep it as long as I could. The potato leaves makes a healthy green sauteed dish too. I waited long enough to harvest my Orangeglo watermelon that I planted from seeds since March. I planted 3 and only this one survived. It’s my first time planting watermelon. I will definitely try again next year. Conclusion: It’s about 3 months when the Bokashi is fully composted at this time of the year. It’s possible to build the base of the trellis with more PVC pipes. It will be one of my future projects. 1. 3/4″ PVP pipe is NOT exactly 3/4″, neither are 1/2″ and 1″ pipes or any of the PVC pipes. In fact, the 3/4″ pipe has an outer diameter of 1.05″ and inner diameter of 0.82″. The number represents roughly an average of the inner diameter and outer diameter, depending on what type of PVC pipes (Schedule 40 vs. thicker Schedule 80). See here for the actual measurements. 2. PVC pipes are very inexpensive and easy to put together like Lego blocks. The 10′ 3/4″ PVC pipe cost me just $2.50. This gave me lots of ideas how to use it for other purposes. See future blogs on the other uses of PVC pipes.